Aaahh! Detective Dixie is on the case! 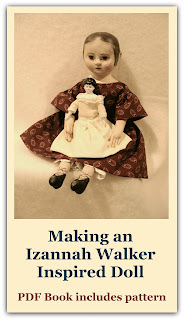 "When my mother was a little girl in the 1860s many of the little girls of Somerset had a Jane Walker doll. I have a picture of mother holding one. They were handsome and lifelike and were made by Miss Jane Walker, who lived on Main Street in the Village. They were made in several sizes and sold for up to 10 dollars. I haven't succeeded in locating one, though it is possible someone has one, as they were quite famous locally and there must have been many of them. 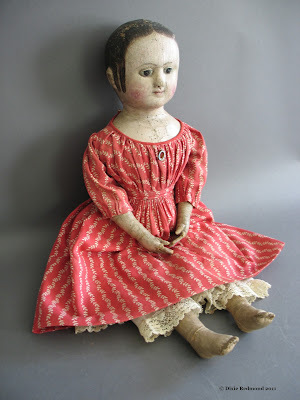 Mrs. Arline Simmons Sampson remembers going to Jane Walker's house when she was a very old lady and no longer made dolls. Mrs. Sampson says she dressed very quaintly almost in Pilgrim style. She liked children, and always treated them to apples and cookies." Izannah's older sister, Jane Walker, remained in the house that was left to the two of them until her death in 1899 at age of 85. Izannah left Somerset in the early 1850's when she moved to Rhode Island. This 1957 paper was presented long before Walker dolls were collected by modern day collectors. Hope this helps.